Our first encounter with the unending gray high-rises that situate Bombay on the map of the world is a street-level tour through the viewfinder of a video camera. 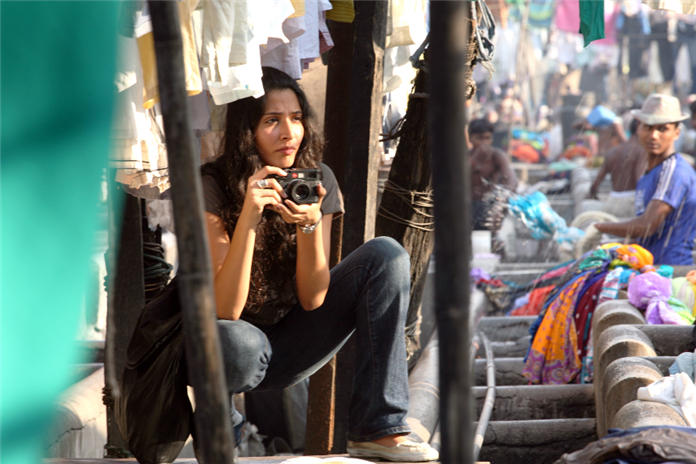 In this opening footage of Dhobi Ghat, on a taxi ride through the relentless rain that washes the megalopolis of Mumbai, Yasmin, the novice behind the lens and a newcomer to the city, expresses the hope that “…the people who built Bombay will find a way to make a place for themselves there.” This strikingly visual work by first-time director Kiran Rao vividly explores what those places might be — or might have been — as we look at them through the time-space axis that is cinema. “Dhobi Ghat” refers to a particular place in Mumbai, the site of uniform rows of side-by-side concrete wash bins where Dhobis labor in the open air as they have for centuries, each with his own flogging stone, to launder the clothes of hotel and hospital residents. Tourists visit the site with a fascination, watching the “Dhobis” at work and often snapping pictures. In this case the photos are taken by Shai, an investment banker from New York who is there to do research and chooses to document it with her camera, her favorite mode of expression. The tool comes in handy when her own “laundry boy,” the vibrant young Munna, who aspires to become a Bollywood actor, coaxes her into taking some head shots of him for his portfolio. He radiates a modest lust for Shai that can win only her photographs, because her heart is off at a gallop after a more mature artist, Arun, whom she discovered the night before at a gallery reception celebrating his paintings. What allows for a conventional love triangle twists in another direction, however, when Arun, brooding over his wife who took off for Sydney, is drawn to a mysterious muse who pervades his new apartment dwelling. Curious remnants of her beauty, her vivacious curiosity, her zest for living that also cultivates patient discipline, grab hold of Arun like a new lifeline all the while that Shai instills in Munna a new-found confidence in seeking his career. Yet there is no melodrama in the rise and fall of these aspirations, no simple resolution of plot, but a poetics of shifting moods and tones as the city seeps into the very real fissures of these tentative relationships. A generation ago, when Indian women who were seeking resources to make their own films met at festival workshops abroad and aired the obstacles to doing their work, they raised two major issues. One was their reluctance to seek funding through international co-producers who, owing to cultural insensitivity, differing production modes, ignorance, or just plain greed, might compromise the art or politics of their projects. The women felt they had too much at stake to forfeit either their sensibility or their integrity as filmmakers: cinema was no game for them and they had no interest in entertainment. They had risked too much, within the confines of complex social and familial structures, not to be taken seriously. 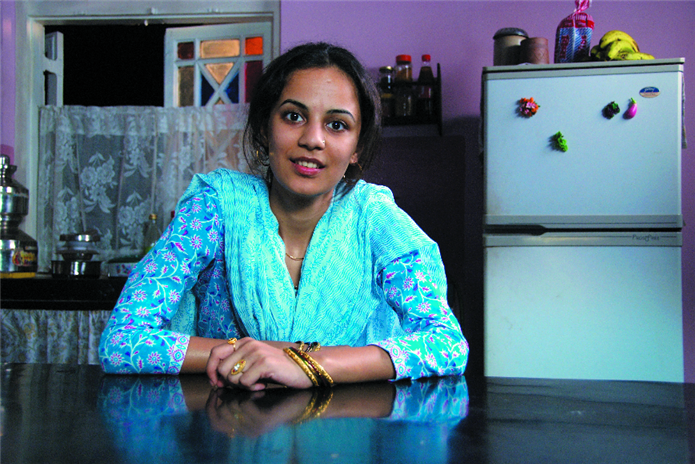 Skirting these issues somewhat, two such women, Deepa Mehta and Mira Nair, established their careers abroad, the first in Canada, where she recently made an ambitious trilogy on the lives of Indian women, and the second in the U.S., where she made a series of fusion “New Wave” films stirring young viewers. In any event, their targets embraced Western, English-speaking audiences and their projects were financed accordingly. But for those who remained, another even more practical obstacle, one relating particularly to India, was the reality of a culturally diverse nation in which many distinct languages were spoken and, worse, in which many of the people they would like to address were illiterate, let alone without money or access to the cinema. Bi-lingual or subtitled films were incomprehensible. Yet for those who could find their way to the screen, formulaic plots with stock characters, not to mention lively music and dance amidst enthralling sets and costumes, provided one set of answers via India’s longstanding Bollywood tradition. Born in Bangalore, raised in Calcutta, and having earned a Bachelor’s in Economics in Bombay and a Master’s in Mass Communication in New Delhi, Kiran Rao moved to Mumbai and worked as an Asssitant Director on Lagaan and Associate Producer on Taare Zameen Par. She then joined Aamir Khan in producing the overwhelmingly popular Jaane Tu Ya Jaane Na and the equally acclaimed critical success, the broad satire Peepli Live. But Dhobi Ghat presented her with new challenges: she took her first turn wearing the writer-director’s hat, and she also co-produced the film with her husband, Aamir Khan, who plays one of the leads. Within that same generation, actor Aamir Khan performed in over forty films in twenty years, becoming one of the biggest stars of Indian cinema. A decade ago, he launched his own production company so as to produce Lagaan, an internationally lauded historical drama set in British India in which he played the lead. In 2007, while still acting, he directed his first film, Taare Zameen Par, which he also starred in and produced. A stunning feat proffering respect and love for children and an enlightening work regarding dyslexia and learning disabilities, the film was hugely successful both at home and abroad. But was there room for a less Bollywood, more original mode of expression in Indian cinema? If so, what audience would it address, and how? So it would seem that the old dilemmas of sacrificing merit for money, the compromise of cultural integrity, and the clash of work ethics could be set aside. In fact, the couple decided to take on more innovative projects that could challenge the status quo through both the content and form of their filmmaking. At the same time, in those twenty years of evolving careers, much of India had begun to face the challenges of globalization, and Mumbai, in many ways, had come to feel like more of a crossroads than a city. Bigger and more eclectic than ever (it now has a populace of 14 million), its social and economic gaps became wider while seemingly less visible. New themes of involuntary transience, directionless mobility, and detachment in lieu of connection all hang in the air of Mumbai today. But there is something more, at least in Kiran Rao’s scope in conceiving of her film. There is the agency of women. And interestingly, it comes with the seeing eye and the speaking voice in a context in which the vital men on the scene perk up their ears and take a different view — through the women’s gaze. There are four such women in Dhobi Ghat, two of them very present, though in entirely different ways, and two who remain largely in the wings and still manage to channel the perspectives of the men. A boundless Shai latches onto Munna, turning the reigns on his city tour and all but giving him eyes to see, while an elderly neighbor lady silently bears witness, whenever Arun walks through his door, to a lingering life that haunts his empty canvas. 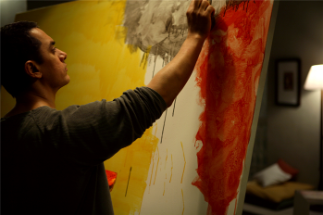 Meanwhile behind the scenes, his flirtatious gallery rep arranges for him to show his paintings in Sydney. By both narrative and cinematic means, these women all motivate the behaviors of the two men (in fact two actors who are prominent as male leads, one a celebrity, Aamir Khan, arguably India’s most renowned actor, and the other fast on the rise, Prateik, the son of the late Bollywood stars Smita Patil and Raj Babbar). 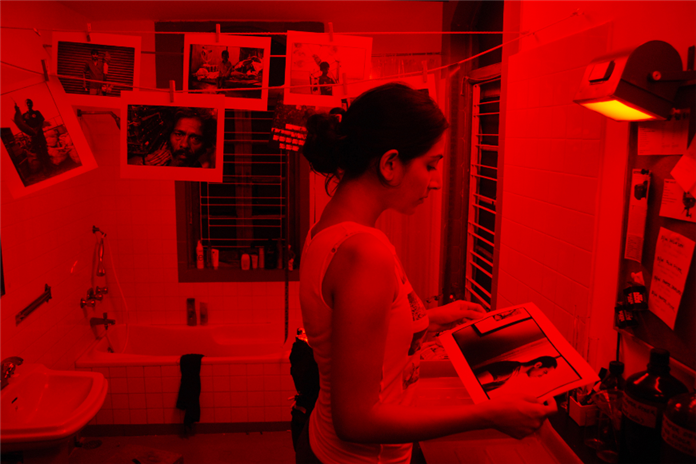 All in all, it’s the ingenious use of mediated images that gives the film its core — Shai's candid street photos of people at work upstage the value of Munna's posed head shots soliciting celebrity, and Yamin's intimate video diaries of longing and acknowledgment galvanize Arun to bear his soul before his easel. Sparks fly, desires swell, and hope fills the air for the next cloudburst, but we can count on it being precipitated by the femmes. Director: Kiran Rao; Producers: Aamir Khan, Kiran Rao; Screenplay: Kiran Rao; Cinematographer: Tushar Kanti Ray; Editor: Nishant Radhakrishnan; Sound: Anup Dev, Ayush Ahuja; Design: Manisha Khandelwal; Costumes: Isha Ahluwalia, Darshan Jalan; Music: Gustavo Santaolalla. Cast: Prateik, Monica Dogra, Kriti Malhotra, Aamir Khan. Color, Super 16, mini-DV-to-35mm, 100 min. In Hindi and English with English subtitles.